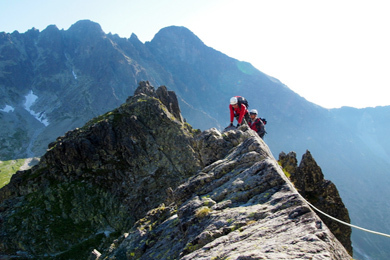 Prostredny hrot (needle, tip) is a very attractive peak for experienced tourists in High Tatras. 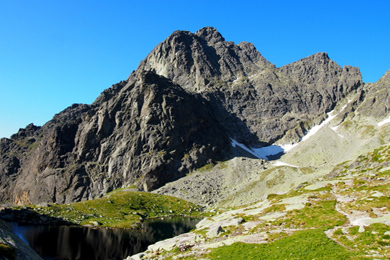 It is the highest summit in the central ridge dividing Mala (small) and Velka (big) Studena Valleys. At a first glance it looks inaccessible, however, if you have some experience with mountaineering one of our mountain guides will be happy to take you there. The ascent of Prostredny hrot begins from Hrebienok. First, it follows a hiking trail up Mala Studena Valley, around Tery’s Hut. Then leads up through Dubkeho lavky all the way to the summit. 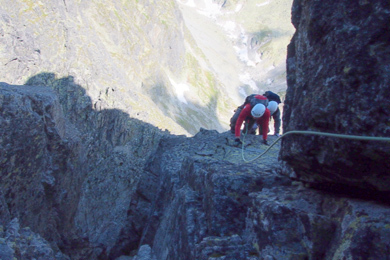 The descent is to lower parts of Mala Studena Dolina. There are beautiful views from the summit, mainly towards the big walls in the west face of Lomnicky Peak and down to Velka and Mala Studena Valleys. In the second half of the 18th century Prostredny hrot was heavily explored by miners, treasure hunters, and hunters. Edmund Tery (doctor and climber) along with a mountain guide Jan Still tried to find visually a potential ascent route from the opposing Lomnicky Peak. Their first ascent came to be on August 11th, 1876. They were joined by Samual Horvay and Tery’s friend Pavol Schwartz from Vienna. The first winter ascent came on April 2nd, 1904. The successful party consisted of Jozef Szelke, Karol Jordán and J. Lackner accompanied by mountain guides Pavol Spitzkopf sr. and Ján Breuer.